In Liberia, a country where radios and televisions are luxuries most people cannot afford, there is one enterprising journalist who has found a way to get daily news and information out to his fellow countrymen – on a black chalkboard. This is Alfred J. Sirleaf and his innovative newspaper is called The Daily Talk. The Daily Talk was started by Sirleaf in 2000 in the middle of Liberia’s fourteen-year-long civil war in the belief that a well-informed citizenry is the key to the rebirth of Liberia after years of war. Each morning, Alfred buys half a dozen newspapers and scours them for the most important developments. For international news, he goes to the local internet café to access sites like BBC. He also relies on messages from volunteer correspondents. Once he has decided what he wants to post, he goes into a little shack he calls the “newsroom” and writes neatly on the blackboards, a meticulous process that can take a couple of hours. The Daily Talk is located in Tubman Boulevard, a main thoroughfare in Monrovia. Many commuters and pedestrians who are just too poor to regularly access newspapers and the internet rely on his chalkboard for their daily dose of local, national, and international news. To reach those who cannot read, Sirleaf has devised a series of pictures and objects to symbolize the news, including a blue helmet for the UN and its peacekeeping force, a white handkerchief for Obama, and a hubcap for President Sirleaf, known as the Iron Lady of politics. In place of photographs he uses old campaign posters and other free handouts. Sirleaf’s The Daily Talk ran into troubles during the first few years. During the fighting, Sirleaf’s coverage of the war’s atrocities and criticism of the Taylor regime angered government militias, and Sirleaf was briefly jailed. 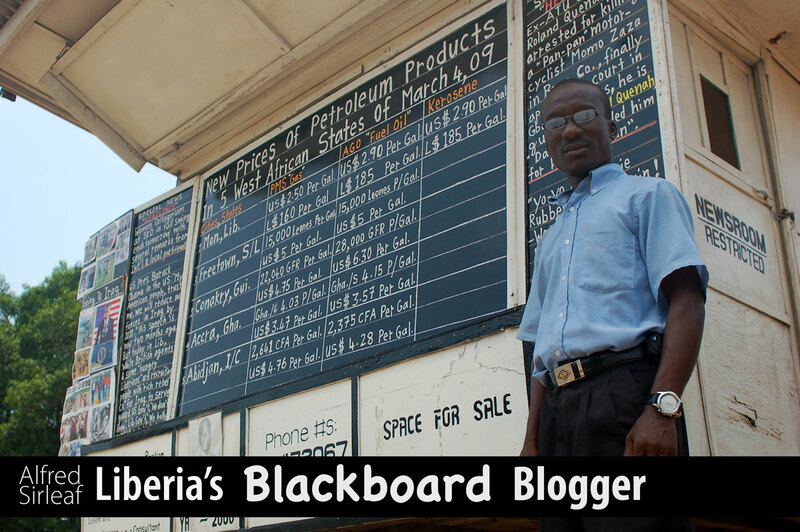 Militias destroyed Sirleaf’s blackboard twice before he finally fled into "exile" in Ghana. As peace returned so did the Daily Talk and today it is one of the most read News Sources in the capital with thousands everyday taking the time to stop as they walk or drive by to get the breaking news. Sirleaf’s most consistent problem is funding. The occasional gifts of cash and pre-paid cellphone cards is all that keeps him in business.